Barry Basden, editor of the Camroc Press Review, writes "I received a call this morning from Charlie's son who said he died peacefully, sitting in his chair after supper on Friday, June 24, 2011, one week after his 92nd birthday. "Charlie attended Oklahoma A and M on a basketball scholarship and played under the legendary Hall of Fame coach, Hank Iba, before graduating in 1942 with an ROTC commission in the U.S. Army and going off to war. "I met Charlie while doing oral histories of WWII vets and helped him tell the story of his wartime service, something he did honestly and without flinching. The resulting book, CRACK! 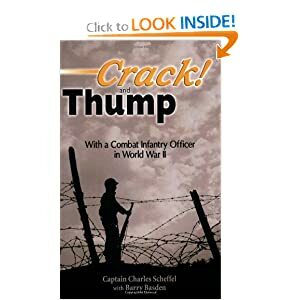 AND THUMP: WITH A COMBAT INFANTRY OFFICER IN WORLD WAR II, is one of the most gratifying accomplishments of my life. "Charlie was one of millions of citizen soldiers who gave the prime of their youth to save the world from tyranny. We owe them a great deal for the blessings we've enjoyed since." After extended stays for specialized treatment at various military and veterans hospitals, Charlie Scheffel retired in January 1946 from disabilities caused by combat wounds at Lammersdorf, Germany. During his military service, he earned the Combat Infantry Badge, two Purple Hearts, the Bronze Star, and for his actions at Cherence le Roussel, the Silver Star and the French Croix de Guerre. Like millions of others after the war, Charlie and Ruth began a family and got on with their lives. They asked for little. They knew life itself was a gift and they sought to be happy. They worked hard and prospered. Their daughters, Susan and Elaine, and their son, Lee, grew up to become productive members of society and raise families of their own. While building a successful insurance business in Oklahoma City, Charlie and Ruth found time to travel extensively throughout America and the world. On a dare from his son, Charlie became an instrument-rated pilot in his fifties, which added to his urge to see the world. After retirement, he and Ruth continued to travel as long as her health permitted. Charlie has been a widower for several years now, but his enthusiasm for travel endures. Hanging on his bedroom wall is a map of the world with a pin sticking in each of about a dozen countries he has yet to visit. He pulled another pin out of his map recently after he sailed to Antarctica on an ex-Soviet icebreaker with one of his granddaughters. His goal is to visit every country in the world and remove every pin from his map. Besides visiting the more exotic corners of the globe, Charlie has also walked the ground where he fought during World War II, trying to come to some understanding of what happened during those uncertain times when tyranny stalked the earth. At the la Gallerie farm, near the village of Cherence le Roussel, he told his story of the four-day battle to the current owner, a woman whose family owned the farm during the war when she was a little girl. She presented Charlie with a bottle of la Gallerie’s Calvados, which he shared with other members of his unit at a 9th Infantry Division reunion. He didn't sweat the small stuff. After combat, not a lot bothered him, but he stuck to his principles when something did. He enjoyed every day. Grateful to be alive. Reminded me of the Delany sisters. Took whatever life handed out and went on. A great kidder. Could strike up a conversation with anyone. Extremely generous. Had a ball with the book, signing it, giving it away, speaking about it before all kinds of audiences, being on TV and in the 'WWII in HD' documentary. A couple of re-enactor groups, one in PA and one in Belgium, made him honorary commander and recreate many of his experiences each year. It was great fun to see all that happen for him. He loved young soldiers, hated war. Thought it was the most stupid way to settle disagreements. Believed strongly that the US should not be the world's policeman. Invited himself to a 3-week U.N. workshop in NYC. The guy said it's for insiders only, what's your background? Charlie sent him a copy of the book and got accepted. Paid his own expenses. If he gave you his word or said he was going to do something, you could count on it. "I needed to say these things. He had a good life. Now the world will be a lesser place and I will miss him." I am sadened to hear that Mr. Scheffel has passed away. I am in great debt to him for the many sacrifices that he made for me and every other american during his lifetime. I feel as though I knew him from watching him on WWII in HD. I had a grandfather who served in the navy during the war and heard many of his experiences as he served in the pacific on the USS Henry D. Wiley DM29 I was so proud of his service. Thank you for your efforts to share in Charlie's life and sharing him with of americans. The world will certainly Charlie and the millions of great americans who have servied this counrty in wartime. Thanks againg for sharing your stories about Charles Scheffel. Let us never forget any of our Vets... PERIOD!!! Keep their memories alive!!! They dont make em like him anymore! Watching him on ww2hd on netflix and im full of tears at the news of his death. RIP im very sad! Thank you for my freedom. I am honored to have seen your story on WWII in HD. My father was in France during WW11. Brave men who fought and died for our country. RIP Mr. Scheffel. And thank you for your service. On this Memorial Day I was saddened to read of your passing last year. But I know you have gone to a better place & Ruth was there to greet you. My dad did his service in the Pacific. My grand kids will be reminded again the signicance of this day. You will never be forgotten. Thank you. I am so sorry to learn of the passing of Charles Scheffel. My Dad was a WW II US Army combat veteran who 1passed away in 1987. Mr. Scheffel had a long and productive life and we all owe him our eternal gratitude for his service both in war and peace. He proudly represents all the men and women who sacrificed so much during the drive for victory in WW II. Rest in peace Mr. Scheffel and thank you for your courage and commitment to freedom. I am sorry to see that you father passed away - his interview as part of the WWII in HD series was run again on TV today. He had an amazing ability to recall detail, and you were fortuntate to have him in your presence for so long, and I am grateful for his service. Your fathers ability to recall that day was very interesting, because like most WWII vets, my uncle didn't like to talk about what they did or saw. I felt like I had better idea of what my uncle went through through your fathers story. For that gift I'd like to thank you and your father. God Bless. Neither Barry Basden (the author of the book) nor I were related to Mr Scheffel. I learned of Scheffel through Barry, and I have tried to help him publicize the memoir. Thank you for reading, and for honoring one of the Greatest Generation. As our family sits here on Veterans Day, and watches Mr. Scheffel in WW2 HD, we are reminded that all gave some and some gave their all. Mr. Scheffel resonated within my soul, touched my heart. The sound of his voice, the way he walked, the way he smiled....brings tears to my eyes and a tinge to my heart. My grandfather served in this war, and was severely injured in the process. I can only hope they may have known each other because both of these men were and always will be, great men. I'm deeply saddened by his passing but also by the passing of what I believe is our greatest generation. Thank you, Mr. Scheffel for all you have done. I can only hope that one day I can meet you on the other side.